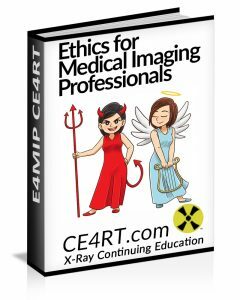 Radiologic technologists are healthcare providers and are therefore obliged to follow certain values and principles. Values such as these do not give answers as to how to handle a particular situation, but provide a useful framework for understanding conflicts. Sometimes, no good solution to a dilemma in medical ethics exists, and occasionally, the values of the medical community (i.e., the hospital and its staff) conflict with the values of the individual patient, family, or larger non-medical community. These values are the basis of the ARRT code of ethics which is strictly enforced. Non-maleficence – “first, do no harm” (primum non nocere). Justice – concerns the distribution of scarce health resources, and the decision of who gets what treatment (fairness and equality). Respect for persons – the patient (and the person treating the patient) have the right to be treated with dignity. Truthfulness and honesty – the concept of informed consent has increased in importance since the historical events of the Doctors’ Trial of the Nuremberg trials and Tuskegee syphilis experiment. When moral values are in conflict, the result may be an ethical dilemma or crisis. Conflicts can also arise between health care providers, or among family members. Some argue for example, that the principles of autonomy and beneficence clash when patients refuse blood transfusions, considering them life-saving; and truth-telling was not emphasized to a large extent before the time of HIV. The principle of autonomy recognizes the rights of individuals to self-determination. This is rooted in society’s respect for individuals’ ability to make informed decisions about personal matters. Autonomy has become more important as social values have shifted to define medical quality in terms of outcomes that are important to the patient rather than medical professionals. The increasing importance of autonomy can be seen as a social reaction to a “paternalistic” tradition within healthcare. Some have questioned whether the backlash against historically excessive paternalism in favor of patient autonomy has inhibited the proper use of soft paternalism to the detriment of outcomes for some patients. Respect for autonomy is the basis for informed consent and advance directives. Autonomy is a general indicator of health. Many diseases are characterized by loss of autonomy, in various manners. This makes autonomy an indicator for both personal wellbeing, and for the well-being of the profession. This has implications for the consideration of medical ethics: “is the aim of health care to do good, and benefit from it?” or “is the aim of health care to do good to others, and have them and society, benefit from this?” (Ethics – by definition – tries to find a beneficial balance between the activities of the individual and its effects on a collective.) By considering autonomy as a gauge parameter for (self) health care, the medical and ethical perspective both benefit from the implied reference to health. Psychiatrists and clinical psychologists are often asked to evaluate a patient’s capacity for making life-and-death decisions at the end of life. Persons with a psychiatric condition such as delirium or clinical depression may not have the capacity to make end-of-life decisions. Therefore, for these persons, a request to refuse treatment may be taken in consideration of their condition and not followed. Unless there is a clear advance directive to the contrary, persons who lack mental capacity are generally treated according to their best interests. On the other hand, persons who have the mental capacity to make end-of-life decisions have the right to refuse treatment and choose an early death if that is what they truly want. In such cases, psychiatrists and psychologists are typically part of protecting that right. The term beneficence refers to actions that promote the well being of others. In the medical context, this means taking actions that serve the best interests of patients. However, uncertainty surrounds the precise definition of which practices do in fact help patients. James Childress and Tom Beauchamp in Principle of Biomedical Ethics (1978) identify beneficence as one of the core values of healthcare ethics. Some scholars, such as Edmund Pellegrino, argue that beneficence is the only fundamental principle of medical ethics. They argue that healing should be the sole purpose of medicine, and that endeavors like cosmetic surgery, contraception and euthanasia fall beyond its purview. The concept of non-maleficence is embodied by the phrase, “first, do no harm,” or the Latin, primum non nocere. Many consider that should be the main or primary consideration (hence primum): that it is more important not to harm your patient, than to do them good. This is partly because enthusiastic practitioners are prone to using treatments that they believe will do good, without first having evaluated them adequately to ensure they do no (or only acceptable levels of) harm. Much harm has been done to patients as a result, as in the saying, “The treatment was a success, but the patient died.” Itis not only more important to do no harm than to do good; it is also important to know how likely it is that your treatment will harm a patient. So for example, a physician should go further than not prescribing medications they know to be harmful – he or she should not prescribe medications (or otherwise treat the patient) unless s/he knows that the treatment is unlikely to be harmful; or at the very least, that patient understands the risks and benefits, and that the likely benefits outweigh the likely risks. In practice, however, many treatments carry some risk of harm. In some circumstances, e.g. in desperate situations where the outcome without treatment will be grave, risky treatments that stand a high chance of harming the patient will be justified, as the risk of not treating is also very likely to do harm. So the principle of non-maleficence is not absolute, and balances against the principle of beneficence (doing good), as the effects of the two principles together often give rise to a double effect (further described in next section). Depending on the cultural consensus conditioning (expressed by its religious, political and legal social system) the legal definition of non-maleficence differs. Violation of nonmaleficence is the subject of medical malpractice litigation. Regulations therefore differ over time, per nation. Double effect refers to two types of consequences which may be produced by a single action, and in medical ethics it is usually regarded as the combined effect of beneficence and non-maleficence. A commonly cited example of this phenomenon is the use of morphine or other analgesic in the dying patient. Such use of morphine can have the beneficial effect of easing the pain and suffering of the patient, while simultaneously having the maleficent effect of hastening the death of the patient through suppression of the respiratory system. Conflicts between autonomy and beneficence and non-maleficence Autonomy can come into conflict with beneficence when patients disagree with recommendations that health care professionals believe are in the patient’s best interest. When the patient’s interests conflict with the patient’s welfare, different societies settle the conflict in a wide range of manners. Western medicine generally defers to the wishes of a mentally competent patient to make his own decisions, even in cases where the medical team believes that he is not acting in his own best interests. However, many other societies prioritize beneficence over autonomy. Examples include when a patient does not want a treatment because of, for example, religious or cultural views. In the case of euthanasia, the patient, or relatives of a patient, may want to end the life of the patient. Also, the patient may want an unnecessary treatment, as can be the case in hypochondria or with cosmetic surgery; here, the practitioner may be required to balance the desires of the patient for medically unnecessary potential risks against the patient’s informed autonomy in the issue. A doctor may want to prefer autonomy because refusal to please the patient’s will would harm the doctor-patient relationship. An individual’s capacity for informed decision making may come into question during resolution of conflicts between autonomy and beneficence. The role of surrogate medical decision makers is an extension of the principle of autonomy. Autonomy and non-maleficence may also overlap. For example, a breach of patients’ autonomy may cause a decrease in confidence for medical services in the population and subsequently the population might be less willingness to seek medical help. The principles of conflict between autonomy and beneficence or non-maleficence may also be expanded to include effects on the relatives of patients or even the medical practitioners, the overall population and economic issues when making medical decisions. There is disagreement among American healthcare providers as to whether the nonmaleficence principle should exclude the practice of euthanasia. An example of a doctor who did not believe euthanasia should be excluded was Dr. Jack Kevorkian, who was convicted of second-degree homicide in Michigan in 1998 after demonstrating active euthanasia on the TV news show 60 Minutes. In some countries, such as the Netherlands, euthanasia is an accepted medical practice under certain conditions. Legal regulations assign this to the medical profession. In such nations, the aim is to alleviate the suffering of patients from diseases known to be incurable by the methods known in that culture. In that sense, the “Primum no Nocere” is based on the belief that the inability of the medical expert to offer help, creates a known great and ongoing suffering in the patient. Informed consent in medical ethics usually refers to the idea that a patient must be fully informed about and understand the potential benefits and risks of their choice of treatment. An uninformed person is at risk of mistakenly making a choice not reflective of his or her values or wishes. It does not specifically mean the process of obtaining consent, nor the specific legal requirements, which vary from place to place, for capacity to consent. Patients can elect to make their own medical decisions, or can delegate decision-making authority to another party. If the patient is incapacitated, laws around the world designate different processes for obtaining informed consent, typically by having a person appointed by the patient or their next of kin make decisions for them. The value of informed consent is closely related to the values of autonomy and truth telling. A correlate to “informed consent” is the concept of informed refusal. Confidentiality is commonly applied to conversations between healthcare providers and patients. Legal protections prevent healthcare providers from revealing their discussions with patients, even under oath in court. Patient confidentiality is mandated in America by laws stemming from the Health Information Portability and Accountability Act (HIPAA), specifically the Privacy Rule, and various state laws, some more rigorous than HIPAA. However, numerous exceptions to the rules have been carved out over the years. For example, many states require healthcare providers to report gunshot wounds to the police and impaired drivers to the Department of Motor Vehicles. Confidentiality is also challenged in cases involving the diagnosis of a sexually transmitted disease in a patient who refuses to reveal the diagnosis to a spouse, and in the termination of a pregnancy in an underage patient, without the knowledge of the patient’s parents. Many states in the U.S. have laws governing parental notification in underage abortion. Traditionally, medical ethics has viewed the duty of confidentiality as a relatively nonnegotiable tenet of medical practice. More recently, critics like Jacob Appel have argued for a more nuanced approach to the duty that acknowledges the need for flexibility in many cases. Confidentiality is an important issue in primary care ethics, where healthcare providers care for many patients from the same family and community, and where third parties often request information from the considerable medical database typically gathered in primary health care. It has been argued that mainstream medical ethics is biased by the assumption of a framework in which individuals are not simply free to contract with one another to provide whatever medical treatment is demanded, subject to the ability to pay. Because a high proportion of medical care is typically provided via the welfare state (ie. Medicare), and because there are legal restrictions on what treatment may be provided and by whom, an automatic divergence may exist between the wishes of patients and the preferences of medical practitioners and other parties. Many so-called “ethical conflicts” in medical ethics are traceable back to a lack of communication. Communication breakdowns between patients and their healthcare team, between family members, or between members of the medical community, can all lead to disagreements and strong feelings. These breakdowns should be remedied, and many apparently insurmountable “ethics” problems can be solved with open lines of communication. To ensure that appropriate ethical values are being applied within hospitals, effective hospital accreditation requires that ethical considerations are taken into account, for example with respect to healthcare provider integrity, conflict of interest, research ethics and organ transplantation ethics. There are various ethical guidelines. For example, the Declaration of Helsinki is regarded as authoritative in human research ethics. In the United Kingdom, General Medical Council provides clear overall modern guidance in the form of its ‘GoodMedical Practice’ statement. Other organizations, such as the Medical Protection Society and a number of university departments, are often consulted by British doctors regarding issues relating to ethics. The ARRT is an example of an organization which requires it’s members to adhere to a specific ethical code of conduct. Often, simple communication is not enough to resolve a conflict, and a hospital, or organization’s ethics committee must convene to decide a complex matter. These bodies are composed primarily of health care professionals, but may also include philosophers, lay people, and clergy – indeed, in many parts of the world their presence is considered mandatory in order to provide balance. The ARRT ethics committee is such a body which resolves conflicts pertaining to its members. Increasingly, medical researchers are researching activities in online environments such as discussion boards and bulletin boards, and there is concern that the requirements of informed consent and privacy are not as stringently applied as they should be, although some guidelines do exist. The delivery of diagnosis online leads patients to believe that doctors in some parts of the country are at the direct service of drug companies. Finding diagnosis as convenient as what drug still has patent rights on it. Physicians and drug companies are found to be competing for top ten search engine ranks to lower costs of selling these drugs with little to no patient involvement. Another issue that has arisen, however, is the disclosure of information. While researchers wish to quote from the original source in order to argue a point, this can have repercussions. The quotations and other information about the site can be used to identify the site, and researchers have reported cases where members of the site, bloggers and others have used this information as ‘clues’ in a game in an attempt to identify the site. Some researchers have employed various methods of “heavy disguise,” including discussing a different condition from that under study, or even setting up bogus sites (called ‘Maryut sites’) to ensure that the researched site is not discovered. The term “Maryut site” is a reference to the story of the creation of a decoy site at Maryut Lake to prevent Alexandria Harbor’s being bombed during World War II. The process of using a Maryut site would be the following: The researcher creates a fake (or “Maryut”) web site that has astructure similar to the research site. The researcher then populates the Maryut site with plausible information. In the research paper, amongst the real information listed, the researcher lists the fake information that is found only in the Maryut site. Culture differences can create difficult medical ethics problems. Some cultures have spiritual or magical theories about the origins of disease, for example, and reconciling these beliefs with the tenets of Western medicine can be difficult. This will be discussed in detail in later chapters. Some cultures do not place a great emphasis on informing the patient of the diagnosis, especially when cancer is the diagnosis. American culture rarely used truth-telling especially in medical cases, up until the 1970s. In American medicine, the principle of informed consent now takes precedence over other ethical values, and patients are usually at least asked whether they want to know the diagnosis. Doctors who receive income from referring patients for medical tests have been shown to refer more patients for medical tests which could lead to unneeded and excessive testing.This practice is forbidden by the American College of Physicians. Fee splitting and the payments of commissions to attract referrals of patients is considered unethical and unacceptable in most parts of the world. Studies show that doctors can be influenced by drug company inducements, including gifts and food. There is concern that industry-sponsored Continuing Medical Education (CME) programs may influence the behavior patterns of healthcare providers. Many patients surveyed in one study agreed that physician gifts from drug companies influence prescribing practices. A growing movement among physicians is attempting to diminish the influence of pharmaceutical industry marketing upon medical practice, as evidenced by Stanford University’s ban on drug company-sponsored lunches and gifts. Other academic institutions that have banned pharmaceutical industry-sponsored gifts and food include the Johns Hopkins Medical Institutions, University of Michigan, University of Pennsylvania, and Yale University. Many healthcare providers treat their family members. Healthcare providers who do so must be vigilant not to create conflicts of interest or treat inappropriately. Sexual relationships between healthcare providers and patients can create ethical conflicts, since sexual consent may conflict with the fiduciary responsibility of the healthcare provider. Healthcare providers who enter into sexual relationships with patients in some cases can face the threats of deregistration and prosecution. Sexual relationships between healthcare providers and patients’ relatives may also be prohibited in some jurisdictions, although this prohibition is highly controversial.